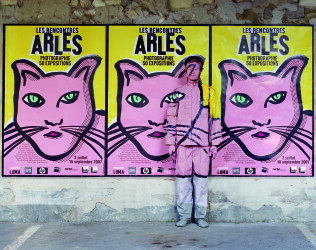 ifa gallery is pleased to present the Liu Bolin solo exhibition curated by Bérénice Angremy and Marie Terrieux. The first work that he presents to the public is a series of photographs entitled “Hiding in the City”, in which a man, often the artist himself, camouflages his face and body to disappear into a seemingly innocent urban landscape. Technically, he carries out the work himself or has someone paint his body and face according to the landscape that will be his backdrop. With time, he carries out the bulk of the work beforehand from photographs, and makes the final adjustments on site. Liu Bolin’s “urban camouflages” are reminiscent of the photographs of the Dutch artist Desiree Palmen, who melts into backgrounds where the unifying characteristic is their complete ordinariness: a street, a door, a wall. Whereas Palmen’s camouflaged people are caught in movement, like a breath of wind, Liu Bolin is caught immobile, transfixed and static, eyes closed. Only the backgrounds move from one shot to the next. Is this person indifferent to the world around him? Here the use of camouflage echoes the instinctive deception of certain animals to melt into their background to hide from predators, or the technique used by war-going soldiers who become invisible to their enemy to better attack. 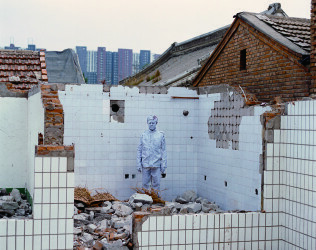 Liu Bolin himself says: “I don’t integrate myself into an environment, on the contrary, I feel invaded by my environment.” Man reverts to an animal state to instinctively preserve himself from danger. 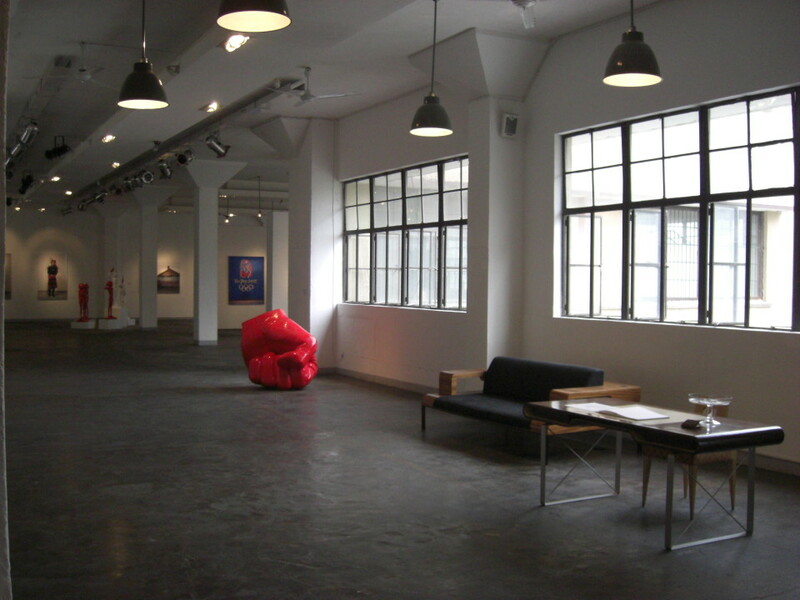 The first photo in the “Hiding” series, taken precisely at a dangerous time, is of Suojiacun, the artists’ village that was due to be demolished in 2006, a few short months after its development by a scurrilous promoter. 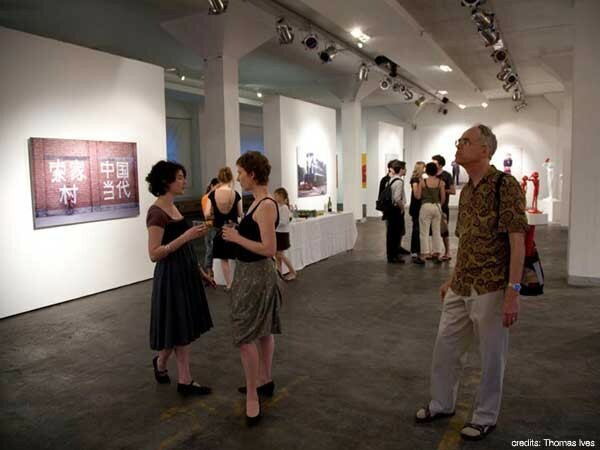 The small community of artists therefore rapidly decides to alert the public to their situation through a series of artistic events. Liu Bolin, forced like the others to move his studio, has only four days to produce work that will become his first camouflage piece. 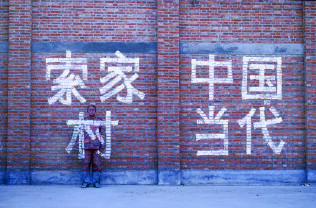 It is an ephemeral sculpture, his performance recorded by photography: it depicts Liu Bolin himself, eyes closed and body painted to meld into the walls of Suojiacun. A second shot full of humour follows, a police officer catching an invisible resistant. 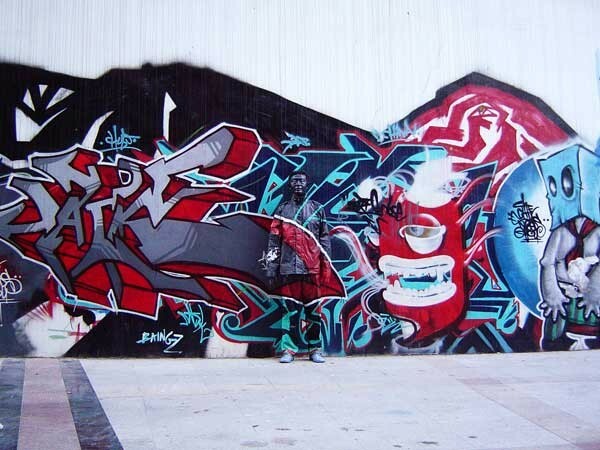 The reality of the background contrasts with the total falsehood of the invisible subject. From then onwards, Liu Bolin throws himself into a series of photographs that form the backbone of his creativity for more than a year. A tenacious critic emerges from behind these friendly camouflages, shots in which the transparent subjects, once revealed in the landscape, become omnipresent. 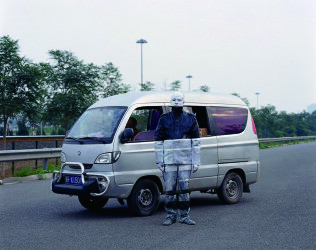 The people portrayed by Liu Bolin belong to the poorest levels of society, the most invisible, like the “illegal taxi” driver camouflaged into his car, the workers that disappear into the walls of the demolished site of the Chai-nai/China exhibition or even the transparent ideal family in the colours of the Chinese national flag. Liu places himself in apparently common place backgrounds– streets, bus stops – but they reveal an urban environment constantly affecting us subliminally – political propaganda or advertisements that rule our daily lives. 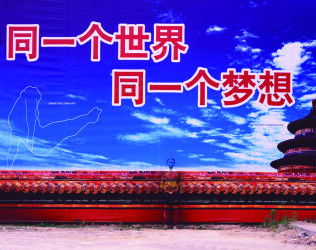 The Chinese characters appearing across decrepit walls and Liu’s body are weighty: “Unify thoughts to promote education”, “Ensure the party advanced forever”, or on a more contemporary agenda “One World, One Dream” set above the iconic Olympic rings. 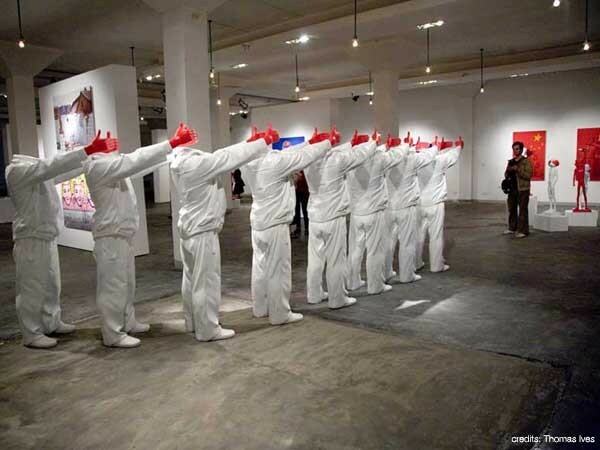 Chinese society’s communal obsessions are reflected on the impassive bodies of the invisible subjects. Organic is also a word that springs to mind when looking at the “Hiding in the City” series or the more recent “Learn by Figures”. With “Memory for Living”, Liu Bolin reflects on the visual signs that invade our daily world, founded on a global language – the signs are drawn in such a way that everybody understands the message – and on identity – the elements such as the sunflower, the chopsticks or the bowl of rice, etc, all refer to a local culture. 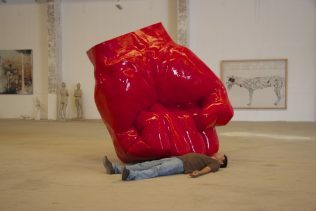 The second break in the very young career of Liu Bolin takes place in 2007 with an emblematic sculpture, the “Closed Fist”. 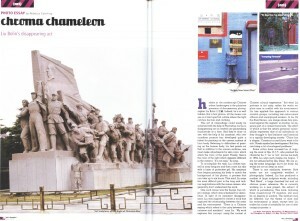 At the time of his urban camouflage period, Liu Bolin’s financial situation is disastrous and he realises that he must produce more saleable works and so he returns to sculpture, more adapted to the market than the camouflages. 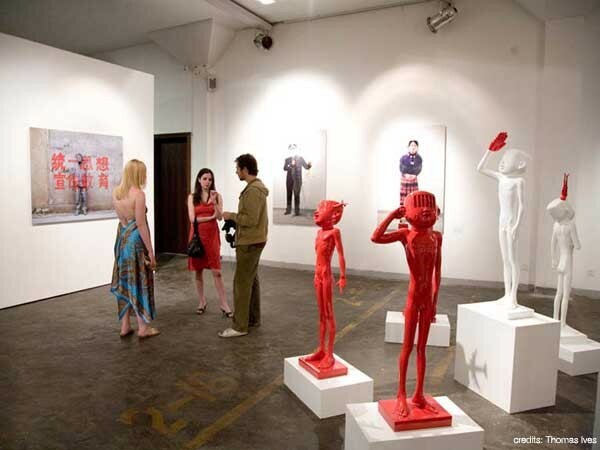 Firstly he produces the wonderful “Burning Mao” series, works produced in bronze, appearing as a sculpted furnace that Liu Bolin has set fire to. The original idea was to produce a sculpture that would redden during combustion, and to have Mao appear out of the flames as red as the hot coals. The result is a series of Maos blackened by the fire. 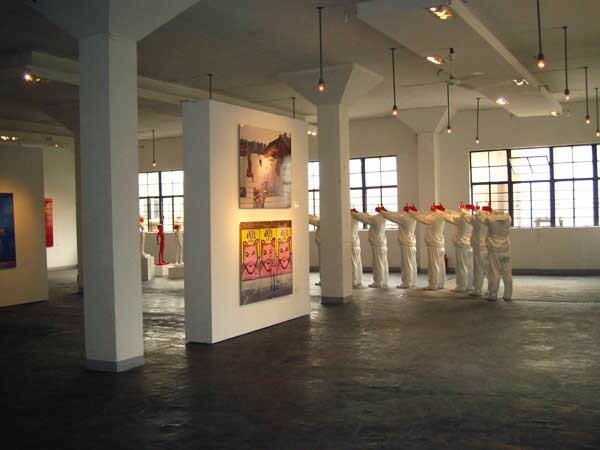 There follows in May 2007 an installation of figures without heads exhibited during DIAF in 798 Art District; and then finally there are the “Red Hands”, a series of sculptures started in July 2007 that are particularly pleasing to western tastes, thanks to which Liu Bolin makes a name for himself. 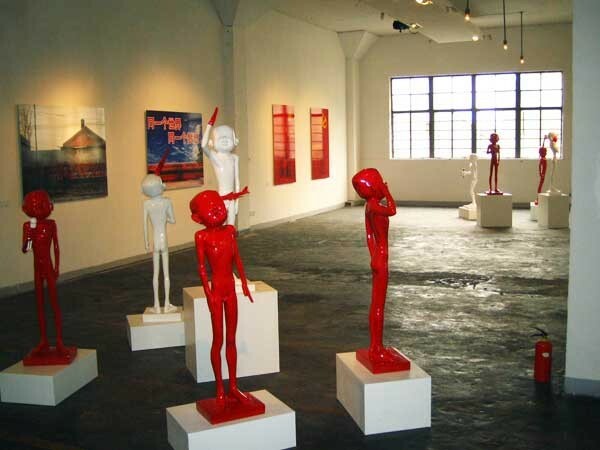 The series is composed of monochromatic red or white boys that are hiding their eyes. 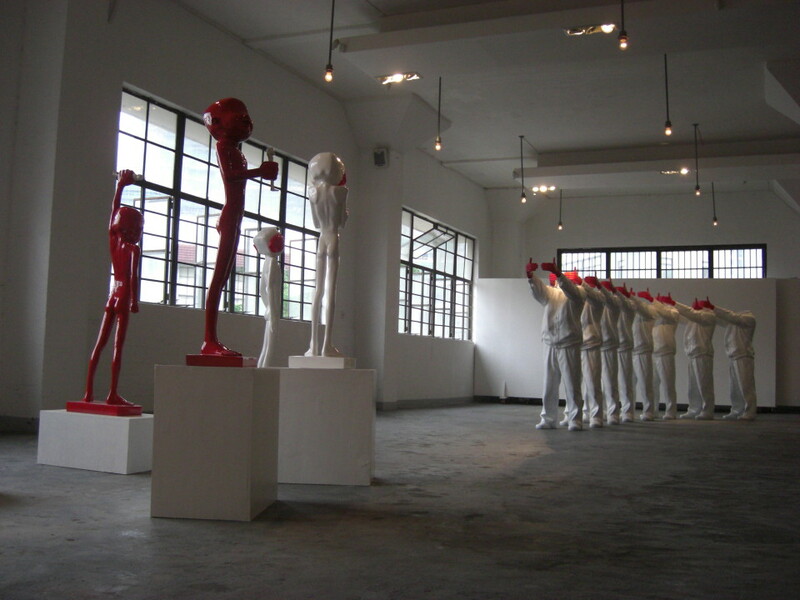 In these pieces of work, Liu plays with the contrast between the use of a bright colour and a smooth material cast in a positive physical pose (youthful bodies, radiant smiles, arched and energetic positions…) – elements that easily draw your attention – and the handicap that characterises each one of these young boys since they are all deprived of their sight. These figures are portrayed at a particularly influencable age to powerfully reflect a generation seeking to free itself from a simplistic education with little choice but to obey. These little men seem to be saying “but I didn’t know, I’m not informed of anything” and as they seem unaware of the world around them they are no doubt saved from much pain. Whether they are born blind or blinded by others, they remain dependent on those that govern them and appear fairly happy this way. 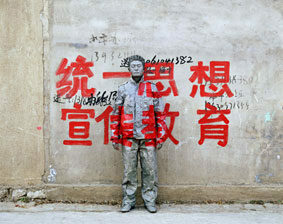 Liu Bolin created them in series, like branded products en masse. In urban camouflages, man becomes invisible. In Red Hands, he becomes blind. Liu Bolin creates a world that appears to be fun and full of bright colours but is in reality uncaring, a reflection of the post Cultural Revolution era to which he belongs. 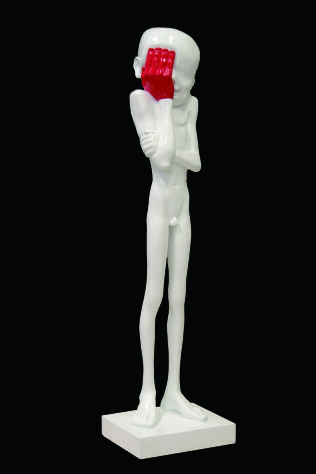 Liu, who considers himself a more realistic than idealistic artist, has managed to express visually a feeling of unease, according to which, despite appearances, everything is not quite right.